Dr James Reilly says food businesses have 6 months to introduce scheme on a voluntary basis, or face a compulsory introduction of it. THE NUMBER OF calories in your food should be displayed on menus in restaurants, bars and cafés, according to a new report from the Food Safety Authority (FSAI). 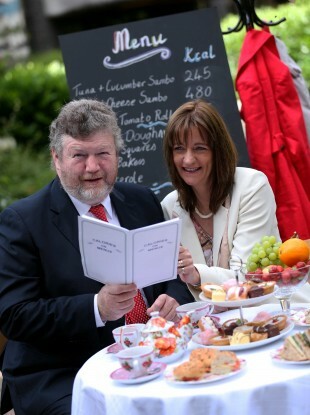 Speaking at the launch of the report in Dublin today, Minister for Health Dr James Reilly said that food businesses should be given six months to implement the scheme, or face its compulsory introduction. “It is essential to recognise that a small, but sustained positive change in the eating behaviour of a large number of individuals can have a major effect on our obesity crisis and I strongly believe that calorie menu labelling offers this potential,” he said. Heart disease, cancer, stroke and type 2 diabetes are all conditions aggravated by obesity, particularly when it occurs at younger ages, according to the FSAI. Calorie labeling is a huge step forward in obesity prevention, according to Dr Mary Flynn, Chief Specialist Public Health Nutrition at the FSAI. “It represents a rare opportunity for health-related interaction between consumers, food businesses and public health bodies,” she said. Calorie menu labelling empowers consumers to make better choices and creates a demand for healthier food in smaller portions from food businesses. According to the report, 96 per cent of people support calorie labeling in food outlets. Another 84 per cent said labeling should also apply to alcoholic drinks. Nearly three in four (73 per cent) food businesses were in favour of calorie menu labeling. However, after considering some of the technical aspects of the scheme, that dropped to just over 50 per cent. According to the Restaurants Association of Ireland, putting calorie counts on menus will cost each restaurant €5000. They said that the move will cripple the restaurants industry at a time where revenues are 20% down on 2011. “How does the Minister for Health and his Department suggest that we pay for this without having to absorb the cost?” said Adrian Cummins, Chief Executive of the Restaurants Association of Ireland. It’s not easy for any business to cough up €5,000 in the morning. The banks aren’t lending any money. Email “Calorie counts should be displayed on menus, says report”. Feedback on “Calorie counts should be displayed on menus, says report”.